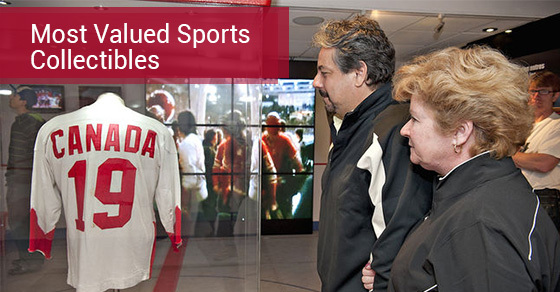 Whether you are a dedicated collector or someone who has come into possession of sports memorabilia and collectibles by chance, there are some items which are coveted by sports aficionados around the world. What’s more, you may have no idea that you have one of these rare treasures lying around your home or personal storage area. Below are some of the most valued sports collectibles. The classic of Babe Ruth confidently pointing into the stands from home plate is one of the most iconic images in all of sports history. Even if you are not particularly interested in baseball, there is a good chance that you know of this historic moment. Well, that jersey is currently valued at nearly 1-million dollars. A tidy sum for a vintage jersey. These gloves from Ali’s 1965 heavyweight title fight against Patterson in Las Vegas helped Ali achieve his second heavyweight title. Boxing memorabilia collectors around the world would love to get their hands on these 1.1-million-dollar pieces of history. Published circa 1859, the original book laid out the rules and regulations which continue to govern the world’s most popular sport. The book was handwritten and has a market value of a whopping 1.4-million dollars. Certainly one of the most important and most expensive sports documents in world sport. Babe Ruth is one of the most iconic names in North American sports history and in 1919, after playing for the Boston Redsox, he was sold to the New York Yankees. Many Boston Fans believe that this move was responsible for the ensuing 86 year world series slump that the team faced. Nevertheless, that piece of paper is now worth roughly $996,000. Henderson has been twice voted into the Canadian Sports Hall of Fame. He is best known for scoring the winning goal in three of the eight games that Canada played against the Soviet Union in 1972 during the two countries’ summit series. The jersey is currently valued at nearly 1.3-million dollars. Nothing unites, divides and captures the collective human imagination like sport and athletic competition between cities and countries. We have assigned incredible value to the iconography left behind by some of the world’s best and most revered athletes. The list of valuable sports collectibles is endless, but above are some of the most expensive pieces to be found anywhere in the world.